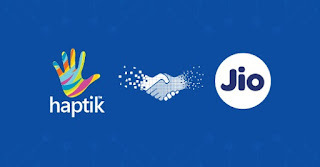 Haptik has entered a strategic partnership with Reliance Industries, through its subsidiary Reliance Jio Digital Services Ltd. (RJDSL/Jio). The total transaction size, including primary capital investment, is about 700 Cr (~100 million USD), with 230 Cr as the consideration for the initial business transfer from Haptik to Jio. The Haptik team will continue to drive the growth of the business, including the enterprise platform as well as digital consumer assistants. On a fully diluted basis, RIL will hold about 87% stake in the company, with the rest with Haptik’s founders and employees. In 2013, Haptik was born out of a belief that conversational UI is the most native experience for the 21st century smartphone user, and that it can be leveraged for more than just personal communication. For over half a decade, we have been at the forefront of the Conversational AI revolution in India – first as a mobile virtual assistant app, and then as a solutions provider for large enterprises. Our platform has cumulatively processed over 2 billion conversations to date. And today, we find ourselves at yet another momentous juncture in our ongoing journey. What does this mean for Haptik? Haptik will remain committed to its overall Vision and Mission,that it has pursued since 2013. Our Vision: To build one of the world’s largest Conversational AI companies, by serving the 1.3 billion people of India. Our Mission: To build artificial intelligence products that enable the paradigm shift of interaction from clicks to conversations. What will change is our ability to achieve our goals. The investment by Jio will give us the support and resources we need to massively scale up our operations – enhancing and expanding our platform into one of the world’s largest, with an addressable market opportunity of over 1 billion users in India. This partnership will also give a boost to Haptik’s existing enterprise business, augmenting our ability to build innovative solutions for enterprise partners across the globe. Moreover, Reliance Jio will now have the opportunity to leverage Haptik’s capabilities across various devices and touchpoints in the consumer’s journey.